Please send an e-mail to: glen.wilkins@wal-mart.com, william.wertz@wal-mart.com. Please also copy: scottselig@seligenterprises.com, sselig@seligenterprises.com, bstogner@seligenterprises.com, jrader@dekalbcountyga.gov, kgannon@dekalbcountyga.gov, ceo@dekalbcountyga.gov, goodgrowthdekalb@gmail.com. 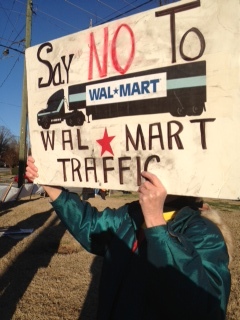 There are hundreds of “Stop Walmart” signs all over Decatur, GA. They voice the sentiment of an overwhelming number of people who live and work in the neighborhoods surrounding Suburban Plaza, where your company and Selig Enterprises are planning to build a 149,000-square-foot Walmart Supercenter. We do not want — or need — a Walmart here. The Decatur and DeKalb County community have shown a desire for sustainable redevelopment that supports local and diverse businesses, not just mega-stores and other national chain outlets like the ones that pop up at every such development. We also desire pedestrian-friendly development. A Walmart Supercenter reflects an outdated auto-centric model of retail that is the antithesis of smart growth. Why do you want to build in a community where you are not wanted?